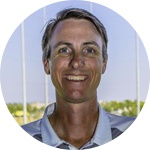 Jacob has been teaching golf for over 20 years and has been a class A certified PGA member since 2009. He grew up in Sacramento, CA where he developed a passion for coaching and growing the game of golf. Jacob spent 18 years teaching golf in San Diego, where he trained with Top 100 golf instructors. He has experience developing all type of players from beginners to advanced, along with special needs. He loves spending time with his family, going to the beach and playing guitar. 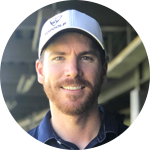 Jacob's goal, when teaching, is to create for each student a simple, natural and repeatable swing motion that coincides with each individual player's physical and psychological abilities. He teaches with unique and relevant concepts of the swing along with encouraging feedback which helps his students have fun while they work toward achieving their goals. Greg is a scratch golfer that has been training to play professionally for the last 4 years. Having started playing in high school, he walked onto his college teams and has been passionate about the game ever since. He has experience with all age groups; from kids and adults, to beginners and aspiring professionals. He knows what it takes to improve, but loves to make the whole experience FUN. Through his own career and coaches, he’s developed a philosophy of education and coaching; not just telling guests they should make a certain move for a successful and repeatable golf swing, but educating them on HOW it works and WHY they should (or shouldn't) make changes.